Do you love clothes just as much as you love Disney? Are you traveling to Disney with a tween or teen that is “over” dressing like a princess and is more focused on style? Try Disney Bounding! 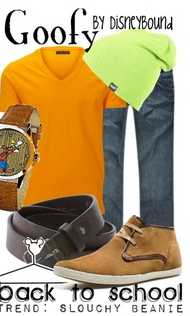 To Disney Bound, put together clothing and accessories that together make up the look of a popular Disney Character. The result? Quirky, wearable outfits suitable for any occasion that subtly reflect your love for Disney! Anyone can create outfits with items straight from the closet. Try pairing a blue blouse with blue pants, sparkling jewelry, and silver shoes to be magically transformed into Cinderella for the day. No one in the office would suspect your devilish success at wearing a costume to work! 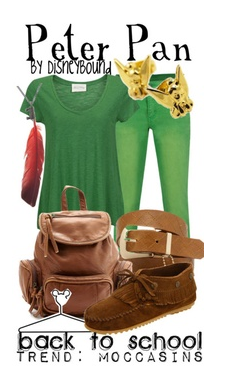 A green shirt, a red feather, brown shoes, and Tinkerbelle earrings and as Peter Pan you’ll never grow up! Want to be Goofy? Try jeans, an orange shirt, and something green in your hair. Gawsh you’ll look amazing! The possibilities are endless! For more ideas, check out http://disneybound.tumblr.com/. This article was written by Lorie Liptak. Great idea for the Parents to bring out the kid inside. We don’t have to wear a ball gown or tights, but can still play the part!. I absolutely love the idea. I think I will try one of these combos next time I go to the Parks.